Wearables, 4K TVs and connected loudspeakers? Multiroom audio systems will be one of the big trends coming out of CES in Las Vegas this week, as a number of companies are looking to compete with Sonos and launch devices that promise consumers access to online music without the hassles of Bluetooth. One of the first contenders is Pure, a British connected speaker maker that has been trying to take on Sonos for some time. Pure initially focused on its very own digital music service, but this week, the company plans to announce that it is opening up to Spotify & Co. through a software-development kit that allows these third-party services to directly interact with Pure hardware. 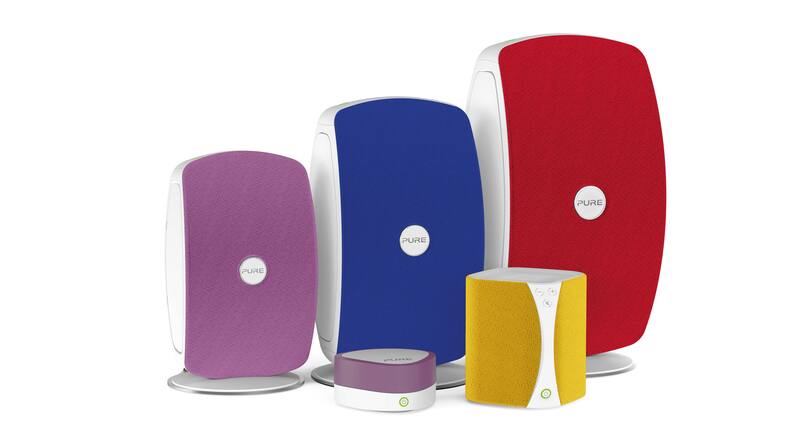 Pure is one of a number of companies trying to take on Sonos. An even more ambitious push comes from Qualcomm. (s QCOM) The chipset maker has been testing the waters with regards to home audio with its Skifta DLNA app for some time. Now, that technology as well as the company’s Alljoyn P2P networking technology have been integrated into AllPlay, Qualcomm’s very own whole-home audio platform. Qualcomm first announced AllPlay at its Uplinq developer conference in September, but is now making the technology commercially available. The company announced a number of launch partners Monday, including Altec Lansing, Panasonic and the Clear Channel-owned digital radio service iHeartRadio. Qualcomm’s AllPlay initiative consists of a number of components, including an audio module that OEM manufacturers can integrate into their own hardware to bring networked aduio features to soundbars and other types of speakers, as well as an SDK for music services that want to integrate AllPlay-compatibility into their apps. I recently had the chance to sit down with Qualcomm’s senior director of product management Sy Choudhury to talk about AllPlay, and asked him why the company didn’t go down the same route as with its Toq smart watch and built its own device. “You could say that we really didn’t need to,” he answered, saying that there’s been a lot of interest from a variety of device makers to add this functionality to their speakers. “Whole-home audio is a huge opportunity,” he said. Qualcomm and Pure are just two of a number of companies that want to bring networked audio equipment to consumers in 2014. Some of them are vying for attention at CES, others are still in stealth and are looking to make a splash later this year. And all of them are benefiting from the fact that the timing is right for whole-home networked audio. One just has to look at how the interest in Sonos, the current market-leader in this segment, has exploded over the last couple of months. For a while, Sonos was known as a company producing devices for music gadget lovers with a good amount of disposable income. But the company has tried to open up to new markets, first with its Playbar and then with its $200 Play-1 speaker. Especially the latter seemed to be a hit during the holiday season, flying off the shelves at retailers like Target (S T) and even briefly selling out on Amazon.com (S AMZN) in December. Interest in Sonos has skyrocketed in recent months, as Google Trends shows. But it’s not just falling prices that make connected speakers so appealing. Nielsen’s latest Soundscan numbers showed that for the first time since the launch of the iTunes Store, digital track and album sales decreased last year. Final numbers for streaming services aren’t out yet, but it looks like Spotify and Co. may be at least partially to blame for the waning interest in digital downloads. At the same time, digital radio is growing like crazy. Pandora had a share of 8.44 percent of all radio listening in the U.S. in November, up from 7.17 the year before and almost double of what it was two years ago. This past November alone, the service streamed 1.49 billion hours of music to its more than 72 million users. What all of this indicates is a fundamental shift in digital music consumption, away from the tracks stored on your iPod or phone to cloud services, whether it be paid subscriptions of free, ad-supported radio. And while the economic impact of this shift on the music industry may still be disputed, it’s clear that connected speakers are to benefit greatly. One of the challenges that the industry is now facing are competing standards. “There is going to be more than a few solutions,” admitted Qualcomm’s Choudhury. Pure Audio’s SDK is different from AllPlay, which is different from the “play to” functionality Sonos is looking to make available to third-party services. This could lead to a world where app makers have to add support for a whole range of networking protocols and APIs to their apps to make them work on a variety of speaker systems, or even to a point where some apps ignore some standards in favor of others. Spotify for example announced its very own Spotify Connect technology with a select number of hardware partners in September, and the company was notably absent from Qualcomm’s list of announced partners. But in the end, the winners may actually be companies that understand how to best market to mainstream consumers that aren’t always willing to spend an arm and a leg just to listen to Pandora. Sonos made great headway when it brought the price of the Play-1 down to $200, but that doesn’t mean that others don’t have a chance. Pure’s speakers for example come with an interesting twist: Instead of forcing consumers to either go for Bluetooth or multirooom audio, the company combined both, offering consumers a way to use their phone’s Bluetooth connection to stream to the nearest speaker, and then replicate that signal via Wi-Fi across all connected Pure devices around the house. The advantage is that Pure speakers work with any and all apps, while at the same time offering synced multiroom audio — and it may just be features like this that take help to take connected speakers mainstream. Is Sonos still the direction we should hang our hat on for the long run? None of these solutions support high def music. Apple has the only complete solution to stream and support high def files. However you have to buy into the Apple Eco-system to get it and the hardware options are pretty limited. Can someone else PLEASE partner with J-River or Amarra or one of the other decent players out there and put a comprehensive system together? There is an iOS app in the App store that already supports multi rooming audio using AirPlay devices – without any additional hardware (except the speakers, the iOS device and the WLAN router). Sonos is easily the best out there, but it’s only because no one else is even trying. Sonos is tremendously slow to market with product, but they got a head start and keep plugging away slowly and predictably. BlueSound has probably the best shot at truly competing with them, because they are bring to market more products at a much faster pace, now virtually on par with Sonos’ offerings. But both completely miss the product possibilities in the commercial, hospitality and professional markets, as well as in car markets, where your car could automatically dock wirelessly, download music at your command and be ready to stream the next day. Both omit the ability to preset and record streams for later playback, which would be a huge hit. Both omit the capacity to control via regular remotes or wall controls or capacities like PoE for extending capacity throughout the home without clutting up the place, or to wirelessly integrate a TV sound in one room when the amplifier is forced to be in another because that’s where the speaker wires are. We’ve got a long way to go. With a SNAPâ€¦ No more earbud wire tangles, painful jerks, or smartphone losses, damage or thefts. All smartphones are sold with wired earbud audio speakers. The Earbud SNAP has the exclusive ability to securely anchor earbud-wired devices to the device user, while providing a safe, comfortable length-adjusted fit and control of the wires. For sale on Amazon.com , Earbud SNAP is a cool, new mobile device protector. The SNAP converts your earbud wires into: 1) a leash to prevent device loss and theft, and 2) a catch wire to prevent dropped device impact damage. Go to “Earbud SNAP Demo” YouTube Video — https://www.youtube.com/watch?v=qbkfRzdB-98 U.S. Patent Pending — All Rights Reserved Â© Taylor Topline, LLC 2014.